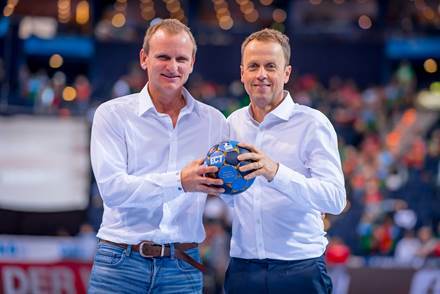 The DKB Handball Bundesliga and Sportradar, the global leader in sports data intelligence, today announced an official Integrity Services partnership, which goes into effect at the start of the 2019-20 season. The announcement comes on the heels of the REWE Final Four (German Domestic Cup) in Hamburg, Germany. Pictured (L-R): Andreas Krannich, Managing Director, Sportradar Integrity Services, and Frank Bohmann, CEO of the HBL GmbH. Picture credit: Klahn.